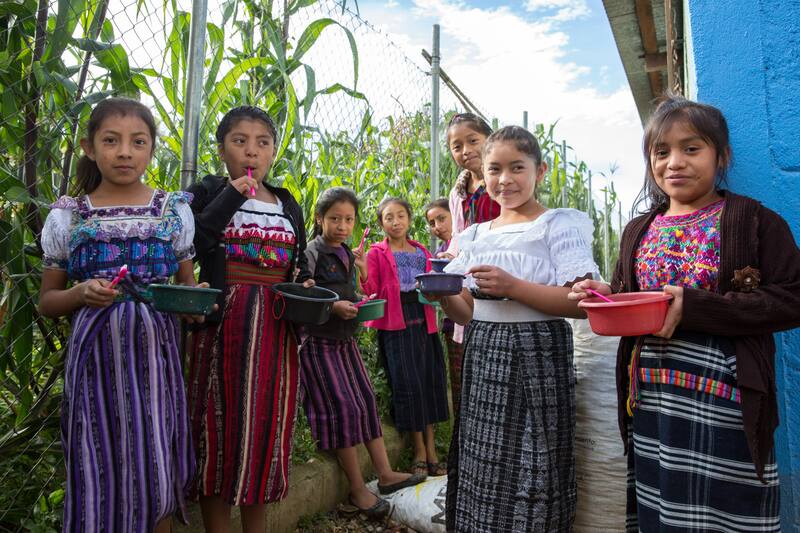 Mil Milagros partners with One Day's Wages to bring health and hygiene solutions to rural Guatemala to fight malnutrition, prevent illness, and create long-lasting change. Poverty, unclean water, and poor sanitation are endemic in the rural Guatemalan communities where Mil Milagros works. These conditions are contributing factors to the high rates of chronic child malnutrition which exceed 70% in Santa Lucia Utatlán. Furthermore, the Guatemalan public school system is significantly underfunded and does not provide students with basic necessities such as clean water or hand soap. Addressing the need for hygiene education and supplies is critical in order to prevent malnutrition, tooth decay, and illness. With support from One Day’s Wages, Mil Milagros is creating changes in our partner communities by implementing the “Healthy Schools Program” which was developed by the Guatemalan Ministries of Health and Education (but lacks any government funding for implementation). The program is designed to improve health and prevent disease by educating children on the importance of healthy hygiene habits like brushing teeth, washing hands, and using toilet paper. These are not common practices in many households, so making sure the children receive this education at school, along with hygiene supplies, is essential. With funding from One Day’s Wages, Mil Milagros is able to provide hygiene supplies (soap, toilet paper, toothbrushes, toothpaste, lice shampoo, anti-parasitic medications, and disinfectant) to the 1,200 children in our ten partner schools. In addition, 100 mother leader volunteers have been trained to apply lice shampoo and weigh/measure the children. Mothers enrolled in our Early Childhood Development program also receive hygiene education and supplies; training these mothers helps ensure that the children learn the basics at a young age. Mil Milagros and One Day’s Wages are partnering to create lasting change in rural Guatemala and we are thankful for our partnership. One Day’s Wages is a grassroots movement of people, stories, and actions to alleviate extreme global poverty. “Mil Milagros and Parenting Journey have completely changed our community. We are so grateful that you are here." Mothers in rural Guatemala improve their self-esteem and parenting skills by participating in this life-changing program. 98% of the water supply in Guatemala is contaminated. Water Charity provides Mil Milagros with long-lasting water filters so our children have clean drinking water in their classrooms, school kitchens and homes. Get Miracles Delivered to Your Inbox!